The State of California considers those issues to be important, and so does the Santa Monica City Council. When presented last month with Residocracy’s “Land Use Voter Empowerment” initiative (LUVE), the council requested a Section 9212 report, which it received from city staff last week. The council will consider the report at its meeting tomorrow night. The report also explains why LUVE, or most of it, would be unenforceable under state law, because state law does not allow voter approval of administrative decisions, and how legislation Gov. Jerry Brown is about to get passed streamlining approvals of certain urban residential developments will likely override much of LUVE. As for point one, for more than 40 years, with little resort to ballot box government, Santa Monica has closely regulated development. Ever since the public rose up in the ’70s and elected new city councilmembers to stop the destruction of the Pier and the building of an island in Santa Monica Bay, there has been a consensus that the City needs to control development. While land use politics in Santa Monica can be remarkably bitter, the differences Santa Monicans argue over are small when looked at objectively, or regionally, i.e., compared to growth in the surrounding City of L.A., L.A. County or southern California as a whole. 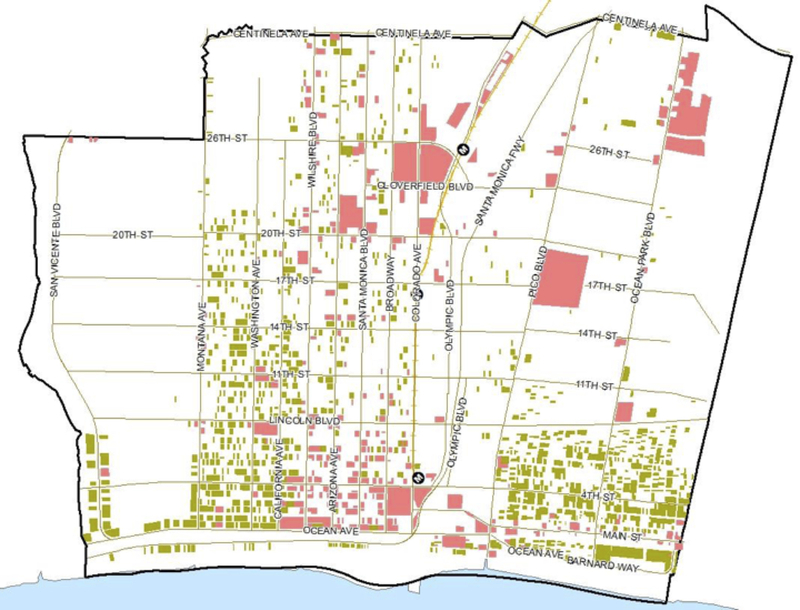 With the Santa Monica City Council’s action last week approving the new zoning ordinance, leaving only a pro forma second reading to finalize the new law, it looked like eleven long years of planning would soon come to an end. The light at the end of the tunnel was finally more glare than glimmer. Slow down. We’re not there yet. Just when you think it might be safe for Santa Monica government to spend more time and resources on something other than responding irrationally to bad traffic, the anti-development group Residocracy is contemplating, dare I say threatening, a referendum on the zoning ordinance. That glare that looked sunny turns out to be oncoming headlights. Well, the answer to that question is no, or at least not until a few generations or even centuries have passed. I mean, even if Santa Monica adds all of the 4,955 housing units predicted under the LUCE by 2030, that’s only about a 10 percent increase in the city’s stock of housing units. That’s unlikely even to result in a 10 percent increase in population, however, because for decades the average number of people living in each housing unit in Santa Monica has been in decline. Even if—as Melkonians fears—Santa Monica should add more than 4,955 units, say, twice that many, by 2030, a 20 percent increase, and even if each percentage point increase in units translated into a percentage point increase in population, well, can someone do the math? How long would it take to double the number of housing units if there was a 20 percent increase every 20 years? Okay, I get it—surely Melkonians was being rhetorical. But that’s what happens when you start asking people to sign petitions. If the first casualty of war is truth, then the first casualty of a local referendum campaign must be any sense of reality. Based on an open letter to supporters that SMCLC leadership published last week, it does not appear, however, that SMCLC wants to join in an effort to overturn the zoning ordinance. For now at least, based on the letter it appears that SMCLC leadership is celebrating the new law, and especially the reductions in the scope of the LUCE, as the product of the anti-development majority SMCLC helped elect last November. This makes sense, since the SMCLC leadership has long ties to councilmembers Kevin McKeown and Ted Winterer and they view the new zoning law as an achievement. Of course, as Melkonians acknowledged to the Lookout, the point of having votes on developments is to scare developers away. While according to him, “only the best projects would go through,” the opposite is true. Developers and landowners will build to the lowest common denominator, slicing and dicing their projects to slip under whatever the voter-approval threshold is. It’s strange to hear a group like SMCLC, which I believe honestly wants better projects to be built, promote voter control as a way to get them. SMCLC blames RIFT’s loss in 2008 on, as Gordon told the Lookout, its being “‘outspent in a deceptive opposition campaign.’” “Deceptive” is in the eye of the beholder, but the last several elections, notably the votes in 2014 on Measures D and LC, if anything show that money doesn’t mean much in Santa Monica elections. Beyond the merits of any thing or person on the ballot, endorsements are what count. In 2008 most of the well-respected elected officials in and around Santa Monica opposed RIFT, and SMRR was neutral. Promoters of new anti-development referendums, whether to overturn the zoning law or to make developments subject to popular vote, would no doubt base their campaigns on their conviction that the views of voters have changed.